Cyprus is lifting the last remaining capital controls it imposed on its banking system during the financial crisis of 2013. Cyprus was the only crisis-hit eurozone country to restrict capital transfers, as it faced a run on the banks. The controls were eased in January. There will no longer be a monthly cap of €20,000 (£15,000; $22,000) on transfers by individuals to foreign banks, or of €10,000 for travellers moving money out of the country. Cyprus received a €10bn bailout from the EU and International Monetary Fund (IMF) after its biggest banks nearly collapsed in March 2013 because of huge losses on their Greek investments. 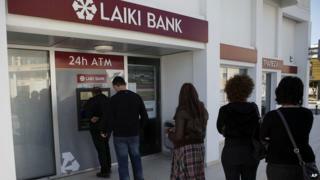 The island's second-biggest lender, Cyprus Popular Bank (also known as Laiki Bank), was wound up and deposits worth more than €100,000 in the largest bank, Bank of Cyprus, were seized. Those measures were part of the deal to ensure that Cyprus funded part of the €10bn bailout. Speaking on Friday, Cyprus President Nicos Anastasiades voiced confidence that the Mediterranean island was recovering well, despite three years of recession. Lifting capital controls, he said, was "a vote of confidence in our banking system which, now fully independent of Greek banking institutions, can move forward". The Greek debt crisis had a severe impact on Cypriot banks, which lost about €4.5bn worth of Greek sovereign bonds - equivalent to 25% of Cypriot gross domestic product, Reuters news agency reports. Cyprus crisis: What are capital controls and why does it need them?